We've been running a series of funny commercials from Israel ever since we started Jewish Humor Central, but we found that the chassidic community in Brooklyn can also be a good source of funny ads and slapstick comedy. Menashe Lustig, who calls himself Mr. Chusid, appears in a series of comedy sketches online that we'll share with you in the weeks ahead. Most of the dialogue is in Yiddish, but the comedy is broad and expressive and can be understood without mastering the mama loshen. 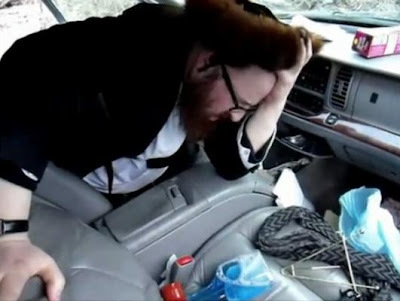 Just in time for Pesach, Lustig, after burning his chometz and reciting the appropriate blessing, proceeds to look for chometz in his car and clean it. Frustrated with the mess and dirty appearance of the car, he first tries to use his yarmulke as a rag to wash the trunk lid, and then gives up. He calls his wife to get the number of a car wash that sponsors the skit, asking her to spell out the number in Yiddish (347-WASH) by repeating "W as in Velvel, A as in Anything, S as in Shin and H as in Hock Nisht Keyn Tchainik." We hope you'll enjoy this as you do your own cleaning for Passover.